"The whiskey drinker's glass" is an authentic, original crystal glass, sandblasted in Scotland with a Celtic knot. This glass is the perfect companion for your tasting experiences. Burns Crystal is a family business established more than 20 years ago. 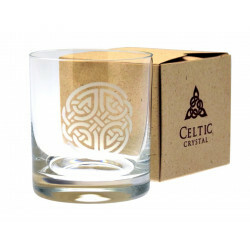 It is specialized in glass and crystal hand engraving. Their workshops are located in Mauchline, Ayrshire, Scotland. Designs are digitized and then hand engraved on glass or crystal with the most modern technologies (CAD images). Their work may be seen in Edinburgh Castle, in St Andrews Golf Club and in the Tower Bridge of London.